True Religion jeans are one of the hottest products around, and are worn by some of the most famous celebrities. The jeans are expensive and highly coveted, though, so it's hard to be sure if you're getting an authentic pair or a fake. To spot a pair of fake True Religion jeans, get ready to look at everything from the stitching to the wash.
Pay attention to the price. If the price is half of what you would pay in the stores or even less, then the odds are good that you just found a fake. As the saying goes, if it seems too good to be true, then it probably is. Look at the pictures if you're buying online to make sure the photos are of the actual jeans and not stock photos from the True Religion website. Seller who use stock photos typically do so because the jeans they sell are fake. Check out the tag inside the jeans. Fake True Religion jeans have a "J" that dips below the rest of the letters and into the horseshoe logo; the real ones don't. Examine the horseshoe stitching on the back pockets. If the stitching has a straight line on the bottom of the horseshoe, the jeans are fake. See if the flaps on the back pockets have a deep V-shape that's a little curvy. Back pockets without flaps or with a perfect V-shaped flap are clear signs of a fake. Make sure the wash of the jeans is light and crisp with only a little whiskering on the hips and legs. The fake jeans often have heavy whiskering that doesn't look authentic. Scrutinize the stitching everywhere on the jeans. 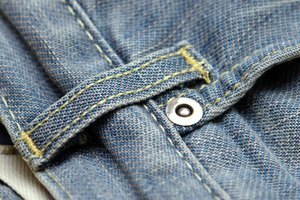 Fakes often use uneven stitches or stitching that is heavy, while True Religion jeans have uniform and professional stitching.